The Artesa Estate Vineyard is set in the steep foothills that straddle the Los Carneros and Mount Veeder AVAs at the southern tip of the Napa Valley. Its proximity to the San Pablo Bay, three miles south, provides the cool, maritime climate ideal for pinot noir and chardonnay. Our 150-acre vineyard is planted along five distinct ridges, with a variety of slopes and soils. 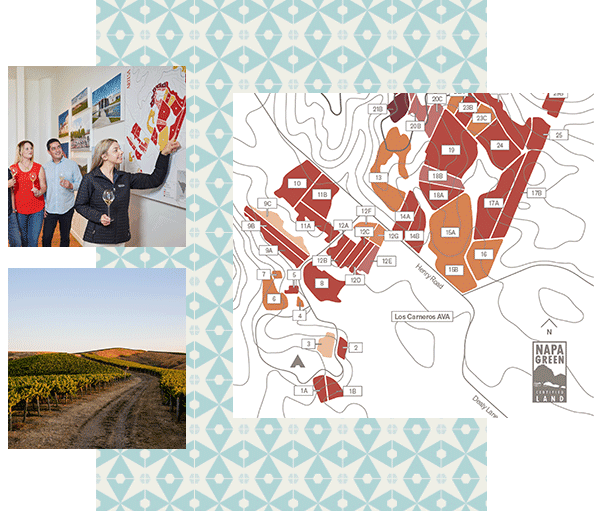 To farm such a complex site, we divide the vineyard in over fifty distinct blocks, tailoring our efforts to the unique character of each block. Most of the vineyard is dedicated to pinot noir – 80 acres are planted in 28 blocks with ten distinct clones. The steep, south-facing slopes of the ranch are dominated by shallow, alluvial soils of weathered sandstone and shale, with long exposure to sunshine and maritime air. These are ideal conditions for growing pinot noir that is clean, balanced, concentrated and distinctively aromatic. Nearly fifty acres are planted to chardonnay in 13 blocks, primarily on northeast-facing slopes that offer some protection from wind and late-afternoon sun and are dominated by Haire Clay Loam soils. Chardonnay from these sites express ripe citrus character and distinctive minerality. Twenty acres are dedicated to twelve micro-blocks specially suited to boutique Estate bottlings. Albariño is planted on two of the coolest sites; low-lying, gentle slopes in the shadow of Milliken Peak. 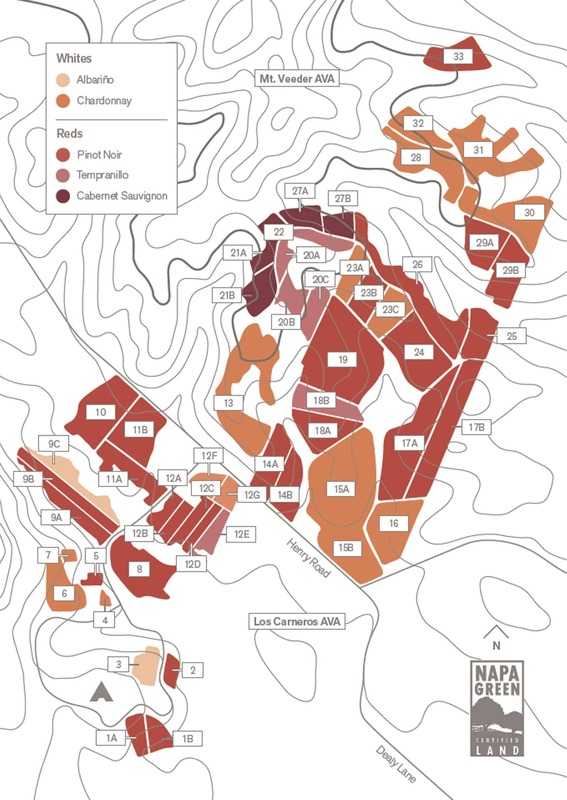 Six blocks of Tempranillo are planted on gravelly soils in the warmest sites, and the very highest ridge of the property, above the 400 foot elevation boundary that separates Mount Veeder from Carneros, are four blocks of Cabernet Sauvignon. The Artesa Estate Vineyard is farmed sustainable in accordance with our certifications for Napa Green Land and Fish Friendly Farming.